Maureen Leverington writes: I would like information about Newton Hall and also all the houses on that side of St Ann's Road from no 72 down past Hannah's Walk, if that is possible please. That section of houses (nos.72,70,66,64) are extremely old yet little seems to be known about them. I was however told by a previous occupier of no 64 that the flat behind the house was used as the maternity hospital during the war and certainly in this lady's occupancy a small, heavily barred room (no longer there) was situated in the attics. This room would have been used for controlling a lunatic. 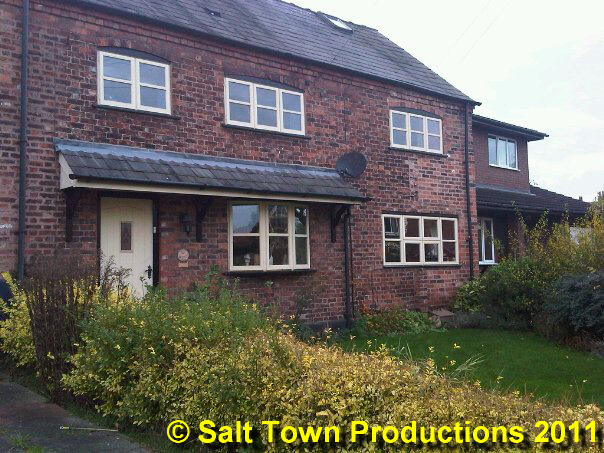 Here's another of the houses Maureen mentions, no 72, as it was on the 23rd November. Obviously very old and much altered, it stands to the left of the other three houses seen above. Number 70, though, which can just be seen to the right of the picture is a modern house (most likely built in the 1980s from the look of it). Presumably it replaces a much older house? And what happened to number 68? There is a space between no 66 and the new no 70, where it could have been. If you have any information on any of these houses and their history, please don't hesitate to get in touch. Geraldine Williams: The third house, with the porch (number 62 -ed) was owned by the Bromwich family - certainly from the late 1940s untila few years ago. John Bromwich had the chemist;s shop at the bottom of Southway*. The chemists was previously owned by Mr Holland and John, who came to work there, married the daughter, Dorothy, and eventually took over the business. So perhaps the house was previously owned by the Hollands, which would take it back to the war years at least. John Bromwich continued to dispense at the shop until ill-health and age forced him to retire (at the end he had to travel by taxi from his house to the shop). He was often called 'Dr John' because Middlewichers had such faith in his good advice. He had a very affable assistant named Joe, who used to cycle down daily from his home by Minshull Vernon railway bridge. His wife Dorothy (who also was always impeccably made-up, Ann) sadly drowned in the canal some time after John died. Dave, I used to take papers to a row of cottages, including No 68. They used to stand back from the road with quite long paths to the front doors.They were either knocked down, or modified to be as they are now. I remember that the people that lived there were mainly quite old ( I was 14 at the time and in those days EVERBODY was old !!!) They were probably the same age as I am now, or even younger. There were also TWO attached Cottages, just around the corner in LONG LANE ( they stood where the first bungalow now stands on the right hand side of the small tractor Lane, as Long Lane then was). I delivered papers to one of the cottages, as well. The two cottages were at the pointed end of a wedge, wheich was where Derbyshires had an orchard, now fill with new bungalows, when Long Lane was then made as a proper road for cars, both ways. This was also when the BLUE CANAL Bridge was first made good for cars, not just tractors.